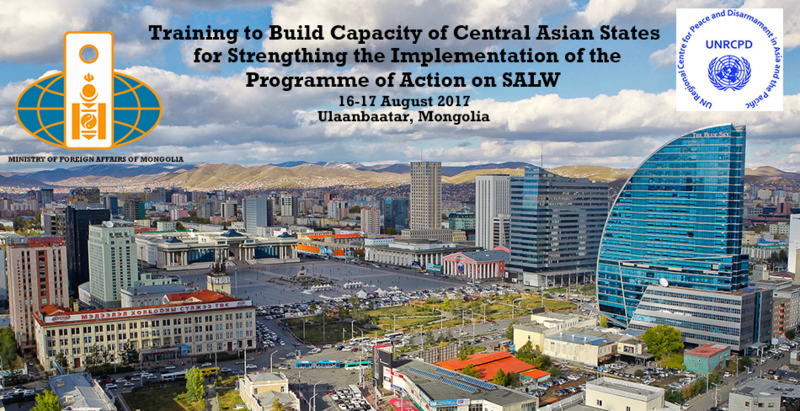 On 16 and 17 August 2017, the United Nations Regional Centre for Peace and Disarmament in Asia and the Pacific (UNRCPD) will facilitate a sub-regional training workshop to strengthen the capacity of Central Asian States to implement the Program of Action (PoA) on Small Arms and Light Weapons (SALW). The event will include practical exercises on utilizing the reporting mechanism of the PoA on SALW and the International Tracing Instrument (ITI) as well as on elaborating National Action Plans. Participants from Central Asian States and Mongolia, representing relevant ministries and agencies involved in conventional arms control, will discuss with experts from UNODA, UNRCPD and the Organization for Security and Co-operation in Europe (OSCE). The training aims to encourage strengthened PoA reporting prior to the 2018 Review Conference. Capacities of participating States will be reinforced to effectively utilize the PoA reporting mechanism to reflect their efforts to prevent and combat illicit trade in SALW, including to monitor and report progress towards achieving Sustainable Development Goal (SDG) target 16.4 to significantly reduce illicit arms flows. Government officials will be provided with practical advice and skills on collecting national data, as well as preparing and submitting national reports online. Participants will also develop an increased understanding of how PoA reporting can contribute to and support national efforts toward assessing progress in achieving SDG target 16.4. Additionally, government experts will develop expanded knowledge and understanding of synergies between the PoA and Arms Trade Treaty (ATT) provisions and will discuss issues and possible elements for National Action Plans to control SALW. The event will be hosted by the Government of Mongolia in cooperation with UNRCPD and is funded by the United Nations Trust Facility Supporting Cooperation on Arms Regulation (UNSCAR). A similar workshop for Southeast Asian States was held in June 2017 in Vientiane, Lao PDR, in the framework of the same project.